Increase Your Health, Decrease The Guilt! Ever read a recipe and think to yourself 'I wonder how I can make this healthier?' I know I do all the time. Today I will anwer that question for you and show you a super easy list of substitutions that you can use in your recipes to increase the health and decrease the guilt. TIP: If you are using cottage cheese as a replacement be sure to puree it in a blender for best results. You can also use Greek yogurt instead of mayo in chicken, tuna, and egg salads! -White flour is processed, whole wheat flour is not. What substitutions do you use when you are cooking or baking?! I love using Greek yogurt for sour cream. 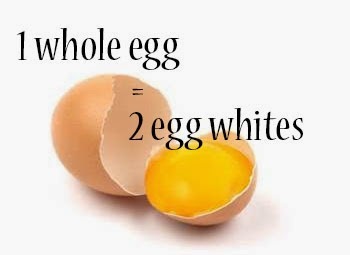 I am a big egg whites girl too. Every little bit helps.